Industrial Technical Engineer and Graduated in Design and Product development at the Alfonso X University of Madrid, Master in Concept Design and Product Development at the Elisava University School of Design and Engineering of Barcelona, and Master in Digital Marketing, Advertising, and Design (specialty 3D design). José Carlos Gálvez is Head of design at TINO Natural Stone after having worked as a designer for different companies such as BTESA Broad Telecom, Lucirmás, and TYC GIS. Today we have the pleasure to talk with José Carlos. We will ask him about the role of design in TINO Natural Stone and he will tell us more about the Interactive Design Center that the company recently set up in its Marbella Showroom. + Those of us who collaborate with you daily know that you “wear many hats”. Could you tell us what your work consists of? It consists of the design and development of plans for different products in marble, especially for the furniture, the graphic representation in 3 dimensions. I am also dedicated to graphic design and web layout. In addition, I am responsible for a virtual room that we have opened to the public where I prepare all the materials and files so that it is always ready to be used and up-to-date with the latest standards. + Product design, the creation of renders, collaboration with other departments such as Sales, Marketing, and Communications, Management of the company’s graphic content. How do you combine everything? I try to organize myself as much as possible so that the projects are being shipped on time. At TINO every minute must be optimized. This is especially true when my colleagues depend on my work and not shipping on time could represent a roadblock for the project to move forward. + Why is it so crucial for a company like TINO to have engineers specialized in product design and graphic designers? Design is becoming more and more critical in the world of stone products and at TINO Natural Stone we have this differentiating value: we do not only supply marble, but we also develop solutions for each type of project as well as unique custom-made designs. 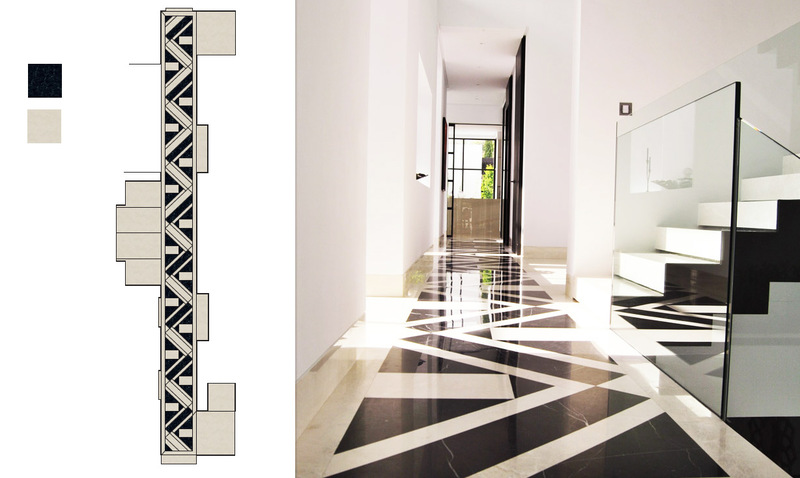 + Recently, the TINO showroom in Marbella opened an interactive design center for architects and interior designers. How does it work? TINO’s interactive design center is a virtual room with a wide variety of materials ranging from Natural Stone, Dekton, Silestone and Wood. In this room, all these materials can be touched and felt. This center allows you to design and appreciate the different materials with interactive renderings, as well as filter the materials by brands, colors, and textures. + How did you achieve this level of interaction? We have achieved this installing computer chips which can recognize each sample. When an architect or interior designer selects material on the screen, lights illuminate the real samples chosen. The visitor can then take the sample and experiment with it. + What types of materials can be experienced in the interactive design center? We have natural stone from all over the world as well as the latest novelties from Dekton and Silestone. We also have selected woods from Finland, representing the Timberwise brand, and from Italy, from Parital. + What is the opinion of interior designers and architects who have already used this tool? They tell us that it is a good support to get an idea of how the materials would look in their projects. You have to bear in mind that a sample does not represent the possibilities of a large-format table. In this room, each client can experiment with the materials and have a clearer idea of what they need or would like to have in their projects.